As I am sure you are aware, there are a number of ways to sharpen a knife. However, the methods and tools you will use vary depending on the type of knife you wish to sharpen, and the time you wish to invest in doing so. 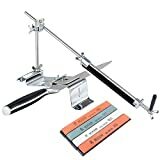 To find out how to use an electric sharpener, manual sharpener, steel and stone sharpeners, simply read on. Electric knife sharpeners are easy to use. That is why they are the most popular type of consumer sharpener available. Here we explain the process step-by-step. First you need to ensure that you have your sharpener placed on a clean surface ready to use. Most models of electric sharpener have suction cups on the base of the unit in order to fasten to the worktop. Dampen the cups and press down to hold in place. The majority of electric knife sharpeners have 2 or 3 stages. Stage 1 & 2 for varying degrees of sharpening, stage 3 (or stage 2 on a 2 stage unit) is used for honing. Each stage will contain tracking guides that accurately hold your knife at the right angle as you operate. (Some models will also have adjustable angle guides so that different knife styles can be used). For a knife with very dull edges, you will be using the first stage. With the unit switched on, you draw the knife gently towards you in one smooth motion. The abrasive wheels within an electric sharpener will spin as soon as they have made contact with the blade. Ensure not to push down too hard while pulling the knife through, and keep it moving at all times. Then within the same stage you slide the knife through again using the parallel slot so that the other side of the blade is sharpened. Only when you reach the curved end of the knife, should you tilt your hand to ensure contact to the very tip of the blade. Allow roughly one second for every 2 inches of knife blade. This means that a 6-inch knife blade should take around 3 seconds to draw through. Pull the blade through the sharpening stage 3 or 4 times on both sides to get the result you need. (Some models will vary in the amount of times you need to do this, cheaper models often requiring more passes – ensure to read the manual carefully for guidance on your machines operational requirements). On a 3 stage sharpener, further refinement will take place in the second stage using the same process as described above. The final stage is used to hone the edge you have created in stage 1 or 2. Again you repeat the process of pulling the blade through each slot within the stage you are using. Hey presto – you have now sharpened your knife and given it a honing polish, all in under 3 minutes. The beauty of the electric knife sharpener is precisely this level of speed and efficiency. It is important to ensure you give the knife a wash before use, as there will be fine pieces of metal left over from the process. Click here to view the Shinkansen manual knife sharpener as featured in the video. Hand Held Manual Knife Sharpeners are also very simple to use. The sharpener will have two slots, one containing a course wheel for sharpening, the other with a finer abrasive for honing. When using a handheld manual tool, you hold your knife vertically while pulling it through the desired slot. Some sharpeners will contain an inset well in the base of the unit which is filled with a lubricant, (generally water, however some manual sharpeners will use oil) that helps lubricate the wheels and keep them cool from friction heat. Both sharpening and honing is achieved by pulling and pushing the blade through the slot, (in a sawing action) ensuring that no downward pressure is placed on the knife. Depending on the type of abrasive material used for the wheels, and the overall dullness of your knife, a manual sharpener will require a number of passes in order to achieve the desired results. Again, you should consult the user manual for more information on this aspect of operation. Sharpening steels are used for the maintenance of a knife rather than sharpening. We all know that the edge of a knife becomes dull through general use. The reason is that the metal edge has either turned left or right, depending on the way you hold the knife while cutting. 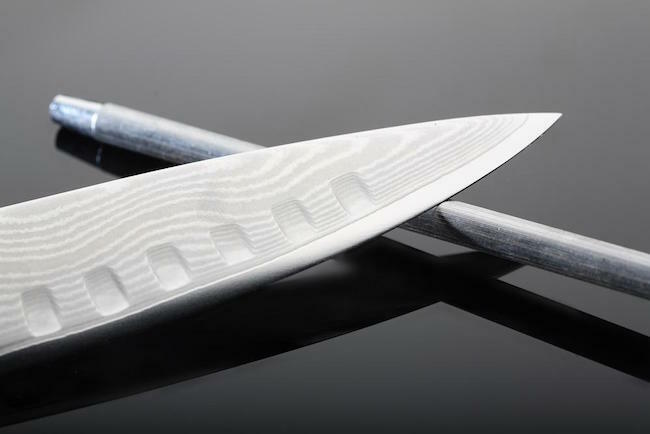 The fact is, knives made out of higher quality materials (such as high carbon and vanadium alloy for instance) can be greater maintained with a sharpening steel. The edge remains malleable enough to be re-aligned through honing. This is why professionals generally insist that a sharpening (honing) steel, used regularly is a preferred approach to using a pull through manual or electric sharpener. When you use the latter, you are destroying your turned edge in order to sharpen. You are in fact shortening the life span of your knives. With a honing steel you are folding the edge back into place. You are maintaining the knife rather than sharpening it. The steel has to be positioned vertically over a suitable surface. This can be a cutting board or a kitchen towel for instance. Selecting the correct angle to use against the steel is the most important aspect of the operation, and can take a little practice. Most kitchen knives are sharpened using a 20-degree angle. Depending on the knife, this will be the angle you will use on the sharpening steel. To find the required angle, you should first hold your knife at 90 degrees to the steel. Easy enough to do. Then, you split this angle in half thus moving your knife to a 45-degree angle. Finally, split the position angle in half again and you will be at a 20 degrees between your knife and steel. With the angle of your knife maintained at 20 degrees, you now take, alternating passes across the steel with the knife. You must only apply light pressure. If you strike harder you can damage your knife. A gentle slicing motion that sees your blade move right across the steel from heel to tip, is the motion you are striving for. It can take several alternating passes, (as much as 10 or 12) across the full length of the knife to achieve the right level of honing. Always make sure that each side of your blade is sliced across the steel in equal amounts. This will ensure an even cutting edge for use. Well done, you have honed you knife for the first time. The action itself is quite straight-forward and is an excellent way of maintaining your knives. In some circles it is said that the best way to sharpen a knife is with a whetstone. While traditionally this may have been true, with the advent of more sophisticated electric sharpeners, that may no longer be the case. 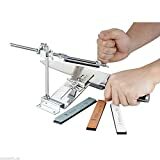 However, there is no getting away from the fact, that those who do master the technique of a sharpening stone, will experience greater control over the way they sharpen their knives. In the long run your knives can end up lasting longer. Your whetstone should have been placed in water over night before use. Remove the whetstone from wherever it has been soaking and place on a clear work surface or cutting board. Ensure that the course grit is facing upwards. (800 – 1000 gauge is recommended). A kitchen towel can be placed underneath the stone to prevent it from sliding around. Like most sharpening techniques, finding the correct angle is half the battle. The cutting edge of the knife should meet the whetstone at either a 15 to 20 degree angle, depending on how sharp you want the blade to be. Applying moderate pressure, you now slide the blade back and forth across the course grit of the whetstone. Ensure that the entire length of the blade is struck across the whetstone, maintaining the same angle through out. Thee amount of times you slide the blade across the stone will depend on how dull the edge is. A good rule of thumb is to slide the blade across the whetstone 10 to 15 times per side of the blade. Check the edge, if it remains uneven or pitted, you will need to sharpen more. Flip the whetstone so that the fine grit side is face up, and slide the blade across the surface of the stone until satisfied that the knife is sharp. To finish off, you can give the sharpened knife a polish using a sharpening steel. Ensure to rinse the knife with water and wipe clean for an remaining metal particles.